The BIBIMBA in real stone pot is the special dinner for Korean family.Hearing 「today's menu is Bibimba!」, my children are pleased very much. Bibimba is the special dinner which is simple for everybody, if only there are stone pots. Each "NAMURU" can be made easily by getting used. This is one of the Quick, Easy, Gorgeous and tasty foods. The only weak point is that the stone pot is indispensable. In my house, It takes only 30 minutes to be ready for cooking by dividing the work to make "NAMURUS" among me and my wife. Arrange the quantity according to your favor. Your favorite taste and quantity will be fixed by making two or three times. Grated garlic is used for every materials. So, decide the full amount of grated garlic at first, and divide them into each "NAMURU" and don't put too much garlic. These are pictures of ingredients for 3〜4 people. Almost all ingredients can be got in JAPAN, and 「KO CHI JAN」is indispensable. This is the KOREAN MISO made by red pepper and KOREAN food can not be made without「KO CHI JAN」. The one in these pictures is the famous bland in KOREA. Cut the carrots into small strips as in the picture, and boil them in the salted water quickly. After taking carrots out of the boiled water, put seasonings and dress them. Dressing by hand is more better. ZENMAI NAMURU takes long time to cook. Prepare ZENMAI NAMURU earlier and make other NAMURUS during cooking ZENMAI NAMURU. Put the wooden lid in the water during making CARROT NAMURU to avoid getting the lid smelled. By putting in water in advance, the lid is hard to get the smell and easy to be washed. Boil the ZENMAI quickly, take ZENMAI out of the water, cut them suitably and fry in the pan which is spread sesame oil, and pour the water, in which all seasonings without ground sesame are mixed well in advance. Put the wooden lid and cook over small flame. Put the ground sesame when the water had gone. Boil the spinach and press them with holding by both hands. Cut about 3cm long, and press them again. Put it in the bowl, add the seasonings and dress them by hand equally. Dress them by hand, not by chopsticks. Then, soaking seasonings into the materials is much different. Put the bean sprouts(without beans) in the pot and pour the water, in which a pinch of salt was added, as much as cover the bean sprouts. Cook over strong flame with putting the lit on the pot After boiling up, throw the water away and dress with seasonings well. The bean sprouts(with beans) are usually used in KOREA. In case of it, cook over small flame after boiling up the water until beans become soft. Put the minced beef in the pan, add the seasonings, and mix them by hand well. Then, fry with stirring by chopsticks. The color of beef is changed and become crumbled, then stop cooking. Now all NAMURUS are ready, then the next is ISHIYAKI. Spread the sesame oil inside the stone pot, put the rice into it, arrange the NAMURUS over rice colorfully, and cook over the medium flame. Just before stop cooking, put an egg on NAMURUS, and add 「KO CHI JAN」as you like about 1 - 2 teaspoons. If the stone pot is cooked over the flame without rice, the stone pot can be broken as in the picture at the bottom. At the case may be cracks. So, be careful. The popping and cracking the surface of the stone pot as in picture, 「SPORLING」we call. Although I am a specialist dealing with this phenomenon, I made spalling by mistake, I am ashamed. Do not eat BIBIMBA keeping the beautiful arrangement. 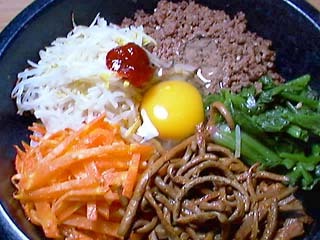 Korean people eat BIBIMBA with long spoon sharpened the end to peel the burned rice sticked on inside the pot. Mix firmly as in the pictures, and eat with burned rice. Crispy burned rice mixed with NAMURUS, BEEF SOBORO, and rice makes harmony and happiness in the mouth.